Look, see, play and score...a lot. Add cards to a grid, making sure that color, shape, and number are either all the same or all different across the line. Sounds easy but as the grid expands, so do the possibilities. Whoever sees the opportunities will seize the win. Iota – The pocket-sized game that’s big time fun. Launch date: September 2012. — In a Fall 2013 survey, two out of 12 retailers told TDmonthly that Iota was their best-selling card game. Players try to harvest the most tomatoes while defending their patch from a garden variety of intruders like weeds, varmints, and even the dastardly tomato The player to haul the most tomatoes to market by the end of the game wins. Launch date: Spring 2012. Players must try to complete as many combo cards as possible by grabbing dice from the dish. The challenge is that they are only allowed to take one die per turn. If players wait to long, another player might snag the die they need. The highest scorer wins. Players spill out the gold and then play cards to claim valuable coins or give the dregs to their no good opponents. With the variety of familiar pirate sayings on the cards, players’ll be yammerin’ like a professional hornswaggler before they know it. Beyond the fun phrases, players also bone up on some key pirate skills like sneaking, bluffing, and swapping, and even some elementary strategy. PLayers must name an object that fits the attributes on their cards and then play them to the grid. The more cards played, the faster players score. For 2 or more players; game time is 20 minutes. Players must quickly rid their hand of cards by playing numbers in order. Lay down a run, but don’t get caught ZZZ-ing or else Zap! – another player will steal the lead. The first player out of cards wins. 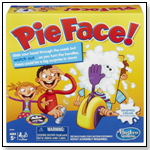 Helps reinforce number sequencing, visual discrimination, and hand-eye coordination. As kids help Emmet pack his trunks, they’ll reinforce such valuable early learning skills as color identification, pattern recognition, and fine motor development. Also, with every roll of the die, they’ll get a little taste of the anticipation they feel before leaving on vacation. Will players get a color and be able to pack their trunks, or will that pesky mouse mess up the plans? 2-4 players, playing time 15 minutes. Includes instructions in English and Spanish. The Scrambled States of America Game is based on the book "The Scrambled States of America" by Laurie Keller. Kids learn learn the names, capitals, nicknames, shapes and positions of the states through a myriad of visual teasers, language riddles and geography challenges. Collect state cards by matching them to a Scramble challenge. Or “Go the Distance” and find a state’s closest neighbor. Collect the most cards to win. New deluxe edition features new art, new challenges, and a copy of The Scrambled States of America book. — In a February 2014 survey, Mark Rosenblum from Hobbytown in Fairfield, C.T., told TDmonthly that Scrambled States was one of their best-selling games. 4 dynamic action images - "picto-verbs" get minds in motion. Roll the dice & the creative problem solving, language learning, and story telling begins. 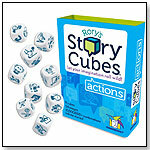 "Once upon a time, a giant LAUGHED..." Rory’s Story Cubes Actions features 9 cubes that illustrate 54 every day verbs. 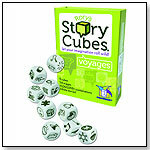 Players can play with them solo or combine them with other sets of Rory’s Story Cubes to kick-start their creativity and set their imagination in motion. — As of 1/02/2012 this product had 4.4 out of 5 stars from 5 reviews on Amazon.com. Each puzzle image is randomly designed and cut in the oddest ways to make it as tricky as possible. The Baffler has no straight edges, no overlapping images and many unique shapes. Each of the three puzzles in the series has a unique piece count: 67 pieces, 69 pieces and 78 pieces. "The puzzles feature unique shapes and no straight edges," Emily Giurleo, marketing coordinator at Ceaco, told TDmonthly. 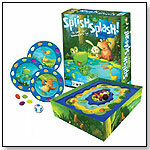 — David Campbell, owner of Amazing Toys in Great Falls, Mont., told TDmonthly in a Summer 2012 survey that puzzles from Gamewright/Ceaco were among his best sellers. Who would win a pie eating contest: Marilyn Monroe or Albert Einstein? Players can settle this and other timeless debates in this hilarious party game of improbable celebrity matchups. Players draw cards and then convince the judge why thier character would win a randomly chosen event. The person who gets the most votes wins the game. Contents include 200 cards, Sand timer, and Rules of play. For three or more players; playing time is approximately 15 minutes. Stack ‘em up … Knock ‘em down. 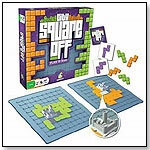 First, players race to build one of five structures by matching up the patterns on your blocks. Then use the battle die to knock off the opponent's crown. Depending on the player's roll, they may get to attack with an avalanche of boulders, a wall-smashing ogre, or even a fire-breathing dragon. The player who racks up the most victory points is crowned the king of the block. Contents include 30 victory tokens, 28 wooden blocks, 4 structure guides, 1 battle die, Rules of play, and Rules in Spanish. Estimated playing time of 15 minutes. This card game that casts players in a contest to build the mightiest Gub colony. Player seek wisdom from The Esteemed Elder or take shelter from a Toad Rider as they fend off a myriad of traps, lures, and other surprising events. Victory lies down an ever-changing path and no one is safe until the final card falls. Contents include 70 cards and Rules of play. For 2-6 players; game time is approximately 20 minutes. Go head-to-head against your opponent in this tactical game of city planning. Draw a shape card and then simultaneously try to fit the matching tile into your city grids. Plot wisely, as you must always have space to play your next piece. Build your city without going over the limits and consider yourself the master planner. Contents include 42 city tiles, 21 cards, 4 starter tiles, 2 game boards, Rules of play, and Rules in Spanish. Roll the die and then drop the wooden pebble into the pond. Did any colorful shapes splash out? If so, match them up to your playing board. Be the first to fill up your board and then dry off with a win. Contents include 50 wooden droplets, 4 character boards,1 custom die, 1 wooden pebble, 1 game board, Rules of play, and Rules in Spanish. Estimated game time is 15 minutes. 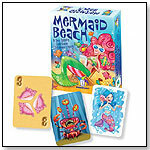 Swim along with Swirly Shirley, Betsy Bubbles, Rip Rider, and a colorful cast of undersea characters as you try to collect the most seashell cards. Watch out for sneaky waves and icky seaweed along the way. Most of all - don’t get caught holding the sea monster at the end of the game. This card game was invented by 8 year old Emily Ehlers. 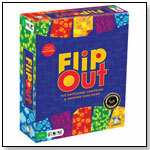 Formerly called Patchwork, FlipOut is a fast-paced logic game for two to five players designed to build logic, memory and patterning skills in a fun setting. Players trade colorful, two-sided cards between plastic racks to create sets, or steal them from each other. Game play takes 20 to 30 minutes. 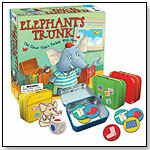 Awards: Dr. Toy 100 Best Children's Products - 2010, 2010 Oppenheim Toy Portfolio Best Toy Award, Gold Seal, Creative Child Magazine Preferred Choice Award, Major Fun Award, Dr. Toy’s 10 Best Games, Tillywig Laugh Out Load Award, Parents’ Choice Approved. Dare to discover Forbidden Island! Join a team of fearless adventurers on a do-or-die mission to capture four sacred treasures from the ruins of this perilous paradise. Your team will have to work together and make some pulse-pounding maneuvers, as the island will sink beneath every step! Race to collect the treasures and make a triumphant escape before getting swallowed into the watery abyss. Includes 58 playing cards, 24 island tiles, 6 pawns, 4 treasure figurines, 1 water meter, 1 water level marker, and Rules of play. For 2-4 players. Awards: 2010 Mensa Select, Creative Child Magazine Game of the Year, FunFare All Star Award, FamilyFun Magazine Toy of the Year Award, Parents’ Choice Recommended. Awards: 2010 Creative Child Magazine Preferred Choice Award, Major Fun Award, Tillywig Best Family Fun Award, Dr. Toy’s Best New Products Picks, Parents’ Choice Recommended, Oppenheim Toy Portfolio Platinum Award. Meet the Dweebies™ in the card game with character. These lovably colorful characters are out to capture your heart, but you must capture them first! Round up Dweebies by matching cards on both ends of any row. Seems simple at first... but Dweebies can be tricky, and some will disappear before they've met their match. Collect the most cards and consider yourself the Dweebie-in-Chief. Includes 54 cards, Rules of play and Instrucciones en Español. For 2-6 players. Awards: Parent's Choice Award 2010, Creative Child Magazine Preferred Choice Award, Dr. Toy’s Best Vacation Products, iParenting Media Award, Major Fun Award, Oppenheim Toy Portfolio Gold Award, National Parenting Publications Awards (NAPPA) Gold. In Sumo Ham Slam, players step into the fierce and furry world of full-contact Sumo hamster wrestling. Using magnetic force, maneuver a Sumo hamster and try to knock the other player's hamster out of the ring. 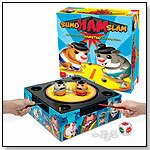 The player that wins the most rounds claims the title of Sumo Ham Slam Grand Champ. Includes 1 elevated game board, 1 custom die, 1 champion chip, 2 magnetic wands, 4 sumo hamsters, 4 scoring pegs, 60 food tokens, and Rules of play. For 2-4 players. "Sumo Ham Slam is a skill and action game featuring adorable sumo wrestling hamsters!" Gamewright Marketing Coordinator Emily Nichols told TDmonthly. Awards: 2010 Dr. Toy’s Best Vacation Products, Creative Child Magazine Game of the Year, iParenting Media Award, Major Fun Award, Oppenheim Toy Portfolio Gold Award, Parents’ Choice Approved, National Parenting Publications Awards (NAPPA) Honors.